Through the 2010s, the growth of Euro Garages has been phenomenal, with a portfolio which has grown to include hundreds of petrol stations and restaurants, one motorway service area, and a wide range of partner brands. Euro Garages were founded in 2001, by the Issa family, with a single independent petrol forecourt in Bury. Since then the company has expanded rapidly, usually by taking over struggling, under-performing petrol stations and redeveloping them to provide additional retail facilities (with various franchise partners including Spar, Subway, Greggs and Starbucks), in so turning around their fortunes. 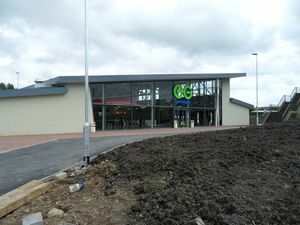 One of their biggest bites was the former Bolton West services, which was rebuilt to provide two large, new buildings. It was announced between April 2013 and September 2015 that Euro Garages purchased around 300 corporate filling stations from Esso and Shell. Euro Garages have added a selection of their partner brands to these sites as part of their ongoing investment plans, which has caused a bit of public controversy as many people prefer Esso's former offering of Costa and Shell's former offering of Deli2go over Euro Garages' new food brands of Greggs and Subway. In June 2013, Euro Garages were the first to introduce Starbucks on the Go into their filling stations, replacing Coffee Nation. The machines get upgraded frequently meaning the new ones are bigger and more modern than the older ones. Recently Euro Garages have been involved in a number of developments next to busy motorway junctions, including Markham Vale on the M1 and Banbury on the M40. Most of these aren't signed from the motorway which would bound them by more regulations, but instead they rely on being highly visible. A Euro Garages-run Starbucks drive thru building. Euro Garages' strategy continued, taking in large services such as Monmouth (including its lodge). They purchased motorway forecourts from more established operators, who were looking to focus on retail. New partnerships with Sainsbury's and KFC opened up new retail opportunities for Euro Garages. 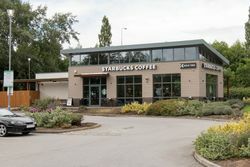 Standalone Starbucks including drive thrus were being built alongside existing forecourts. However the partnership with Sainsbury's did not last long as Sainsbury's pulled out on the 8th February 2018 and the Sainsbury's Local stores on Euro Garages forecourts have all been replaced with Spar. In December 2016, it emerged that Euro Garages were looking to take over Little Chef and purchased it on 1 February 2017. Many of these restaurants were next to forecourts Euro Garages had already acquired. The Little Chefs have now been replaced with other brands such as Starbucks and Greggs, often involving a considerable redesign of the building. There is also a list of service areas covered by this site where Euro Garages operate restaurant facilities, with an established brand name under a franchise agreement. The following petrol stations are signposted from the A-road they serve. At many of them, Euro Garages also provide their own catering facilities.